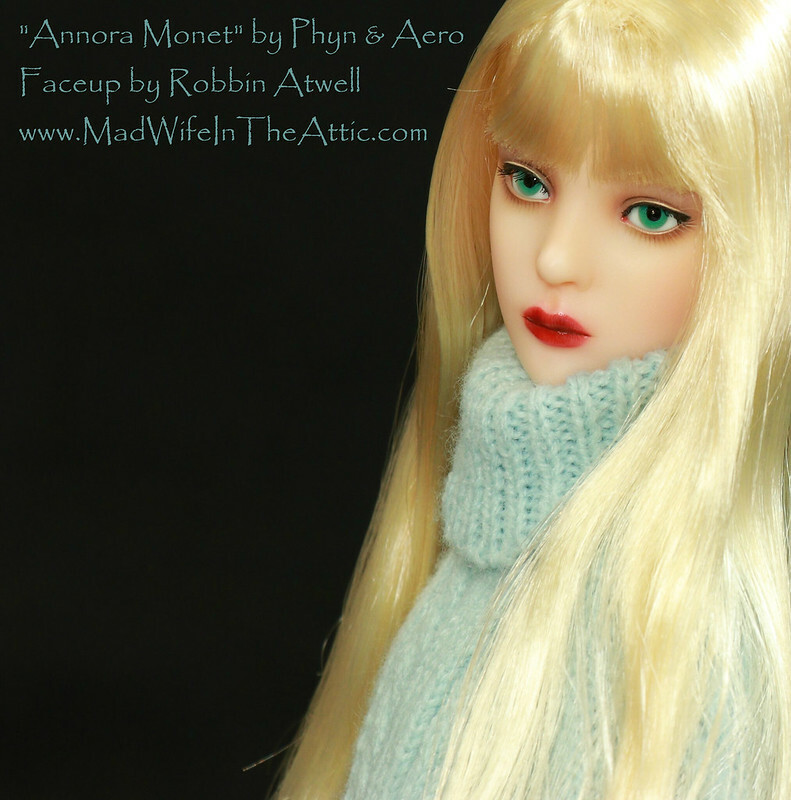 I got the opportunity to paint a 2nd Phyn & Aero “Annora Monet.” This one belongs to my friend Marcia, who owns Facets Boutique (for all your fashion doll needs). 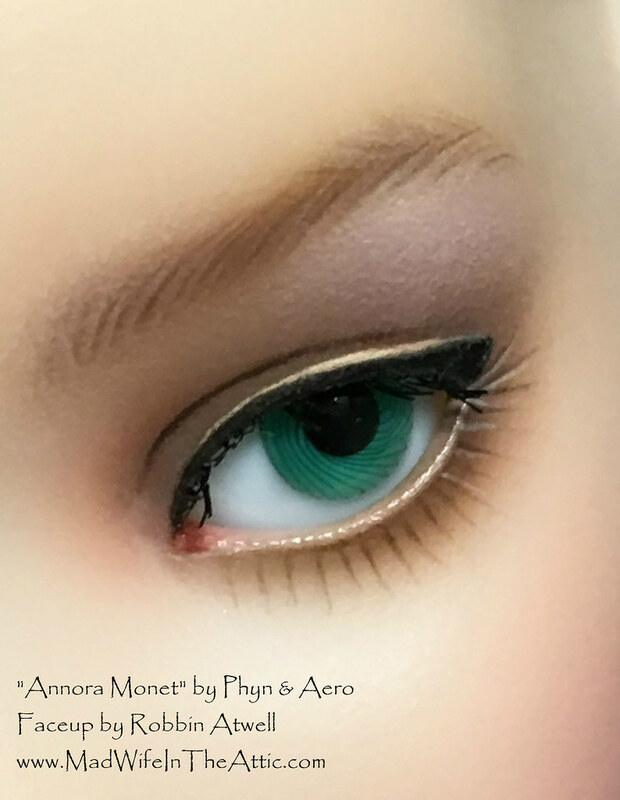 This Annora will be more of a high fashion style girl. 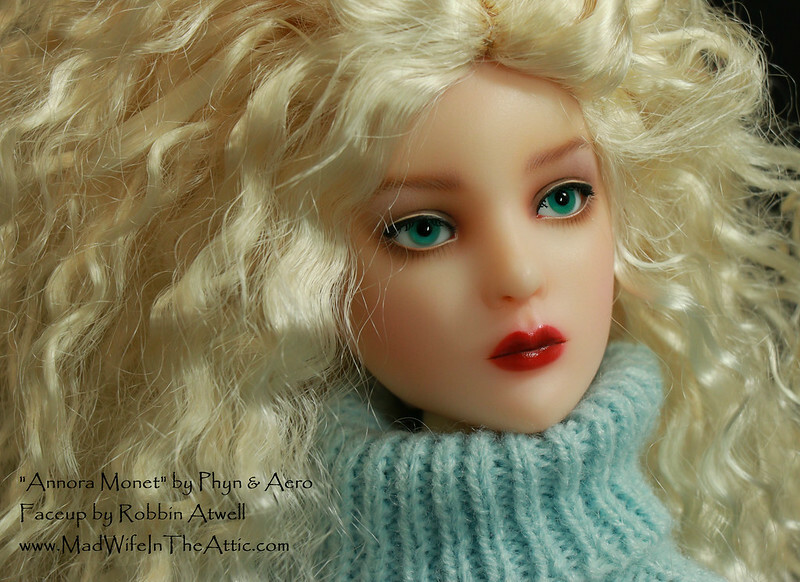 Marcia asked for red lips, reddish brown eye brows, a natural look, and no pink around the eyes. What?? All my girls have pink around the eyes! What I see as artistic, others see as conjunctivitis. OK, no pink (well not a lot anyway). 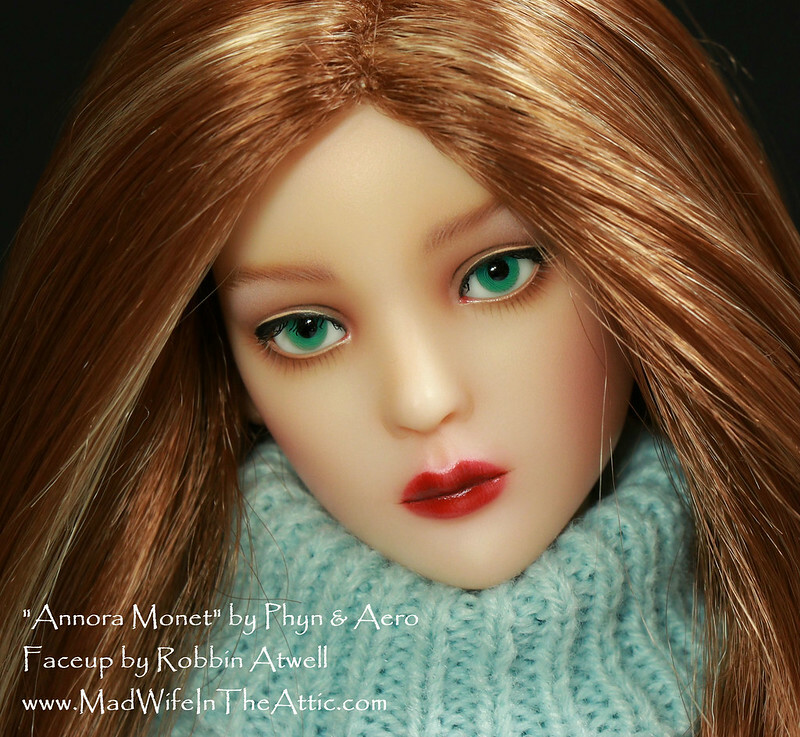 Since I’ve gotten positive feedback for my step-by-step photos, I’ll share more of them of this Annora too. Note that differences in resin colors is due to different lighting, and different cameras — nothing was done to alter the resin color. Step 1: A clean head, sprayed with sealant. Step 2: Base colors applied to all parts of the face. Step 3: More color is layered on all areas of the face and brow hairs and lower lashes are painted. Step 4: More color is layered on all areas, brows are filled in and highlights are added. This is where I hit a glitch. I always paint lips to look pouty with a lot of emphasis on the cupid’s bow and I exaggerate the volume of the center of the upper lip–called the “tubercle.” Marcia didn’t love that. She asked to have that feature de-emphasized if it wouldn’t mess up the rest of the face. I really didn’t know what I could do but decided to try. If it didn’t work, I’d wipe the face and start over (not fun). I experimented a bit because in this process, you can’t undo your painting. It is always a process of adding–not subtracting. I was able to gently scribe part of the area and lift off the paint. Then, I touched it up and matched the existing paint. The lips have a more realistic and mature look now. The final steps are just more refining, fussing, and obsessively touching up. I’m extremely pleased with the way she turned out. I managed to only put a smidge of pink at the corners of the eyes and I was able to modify the lips successfully. Best of all, I really love how this same sculpt can have very different personalities. That’s what draws people to these customizable dolls. 24 Jan	This entry was published on January 24, 2018 at 6:28 pm. 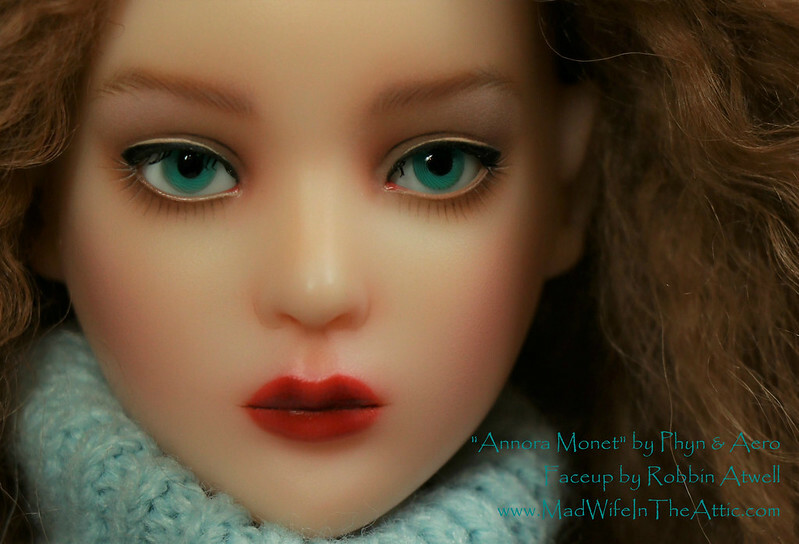 It’s filed under Ball Jointed Dolls, BJD Faceups, Tutorial and tagged ABJD, Annora, Ball Jointed Doll, BJD, Dolls, Faceup, Painting, Phyn & Aero, Resin, Robbin Atwell, Tutorial. Bookmark the permalink. Follow any comments here with the RSS feed for this post. You did a fabulous job bringing this doll to life. Just beautiful!